With a key UN Sustainable Development Goal for 2030 being to make basic education available to all the world’s children, Learning Spaces in Africa explores the architectural, socio-political and economic policy factors that have contributed to school design, the main spaces for education and learning in Africa. It traces the development of school building design, focusing on Western and Southern Africa, from its emergence in the 19th century to the present day. 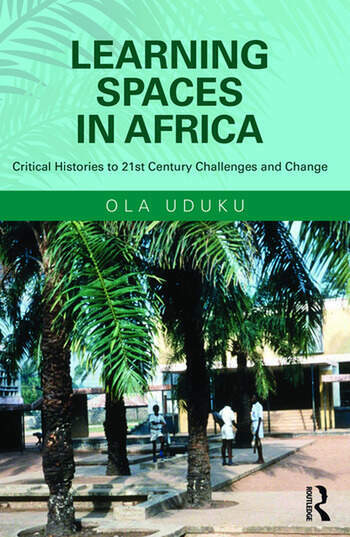 Uduku’s analysis draws attention to the past historic links of schools to development processes, from their early 19th century missionary origins to their re-emergence as development hubs in the 21st century. Learning Spaces in Africa uses this research as a basis to suggest fundamental changes to basic education, which respond to new technological advances, and constituencies in learning. Illustrated case studies describe the use of tablets in refugee community schools, "hole-in-the wall" learning and shared school-community learning spaces. This book will be beneficial for students, academics and those interested in the history of educational architecture and its effect on social development, particularly in Africa and with relevance to countries elsewhere in the emerging world. Ola Uduku is Professor of Architecture at the Manchester School of Architecture, UK. She completed MPhil and PhD degrees in Architecture at the University of Cambridge focusing on School Design in Nigeria and has taught at Liverpool, Strathclyde and Edinburgh universities. She has written on and researched extensively into the history of school design and its influence on education in Africa and has research interests in contested urbanism, West African modernist architecture, passive design and thermal comfort in the tropics.